I am involved in some public outreach through the UMPC and with local high schools and some Missoula organizations. My hobbies include hiking, skiing and outdoors as well as playing guitar. Learn more about me from a 2014 interview with the Eerie Digest. Stanley, G. D., Jr. 2017. Coral Diseases. In McGraw-Hill Yearbook of Science and Technology 2017, p. 1-7, McGraw-Hill, New York. Hubbard, D.K., Rogers, C. S., Lipps, J. H., Stanley, Jr., G. D. 2016. Coral Reefs at the Crossroads. Coral Reefs of the World Series v. 6, Springer Science Publishers. 300p. Stanley, G.D. 2015 Geologic history of reefs. In McGraw-Hill Yearbook of Science and Technology 2015, p. 124-126. McGraw-Hill publishers, New York. Roniewicz, E. and Stanley, G..D., Jr. 2013. Upper Triassic corals from Nevada, western North America, and the implications for paleoecology and paleogeography. Journal of Paleontology v. 87, no. 5, p. 934–964. Stanley, G.D., Jr. and Brayard, A. 2013. Metazoan reef evolution in the aftermath of the end-Permian mass extinction. World Summit on Permo-Triassic Mass Extinction and Extreme Climate Change, June 13-15, Wuhan, China. Abstracts volume, p. 64-65. Z.-Q. Chen, H. Yang and G. Luo, (eds.). China University Geosciences, Wuhan. Stanley, G. D., Jr., Yancey, T.E. and Shepherd, H.E. 2013. Giant Upper Triassic bivalves of Wrangellia, Vancouver Island, Canada. Canadian Journal of Earth Sciences v. 50, p. 142-147. Shepherd, H.M.E, Stanley, G.D. Jr., and Amirhassankhani, F. 2012. Norian To Rhaetian Scleractinian Corals In the Ferdows Patch Reef (Nayband Formation, East Central Iran). Journal of Paleontology 86, p. 801-812. Senowbari-Daryan, B., Stanley, G.D., Jr. and Onoue, T. 2012. Upper Triassic (Carnian) reef biota from the Sambosan Accretionary Complex, Kyushu, Japan. Facies v. 58, issue 4, p. 671-684. Stanley, G.D., Jr. 2012. Ocean acidification and the ‘Naked coral’ hypothesis. p. 27-28 in Book of Abstracts, D. Yellowlees and T. P. Hughes (eds.) Proceedings of the 12th International Coral Reef Symposium 9-13 July 2012, Cairns. James Cook University, Townsville, Queensland, Australia. Moore, K. L. and Stanley, G. D., Jr. 2012. 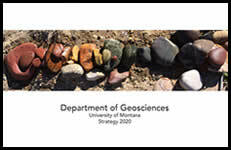 Enhancing the Bear Gulch Paleontological Research Collection at The University of Montana. The Society For The Preservation of Natural History Collections Collection Forum v. 26 (1-2), p. 4-11. Lamaskin, T. D. Stanley, G. D., Jr., Caruthers, A. H. and Rosenblatt, M.R. 2011. Detrital record of Upper Triassic reefs in the Olds Ferry Terrane, Blue Mountains Province, northeastern Oregon. Palaios v. 26, p. 779-789. Stanley, G. D., Jr. (ed.) 2011. Corals and Reef Crises, Collapse and Change. PaleontologicalPaper 17, The Paleontological Society, Boulder, Colorado, 160pp. Stanley, G. D., Jr. and Lipps, J. H. 2011. Photosymbiosis: The driving force for reef success and failure. Paleontological Society Paper 17, p. 33-60. Han, J, Kubota S, Uchida, H-O., Stanley, G.D., Jr., Yao, X., et al. 2010. Tiny Sea Anemone from the Lower Cambrian of China. PLoS ONE 5(10): e13276.doi:10.1371/ journal.pone 0013276. Stanley, G. D., Jr. 2010. Recovery of corals and reefs after the end-Permian and the“Naked Coral” Lazarus effect. Journal of Earth Science v. 21, p. 161-164. Stanley, G. D., Jr. 2009. Corals and ocean acidification. (Invited Chapter) In McGraw-Hill Yearbook of Science and Technology 2009. McGraw-Hill Companies, Inc., New York, pp. 66-69. Stanley, G. D., Jr. and van de Schootbrugge. 2009. The evolution of the coral-algal symbiosis. Chapter 2. In M.J.H.van Oppen and J. M. Lough (Eds.) Coral Bleaching: Patterns, Processes, Causes and Consequences. Ecological Studies Series, v. 205, pp. 7-19. Stanley, G. D., Jr., Caruthers, A. H. and Blodgett, R. B. 2008. From hot and tropical to cold and Arctic: The Triassic history of the Wrangell Mountains. Alaska Park Science, v. 7, issue 1 (June, 2008), pp. 4-15. Stanley, G. D., Jr. 2007. Ocean acidification and coral reefs. Science, 24 August 2007, v. 317, pp. 1032-1033. Stanley, G. D., Jr. 2006. Photosymbiosis and the evolution of modern coral reefs. Science, v. 312, 12 May 2006, pp. 857-858. My published work consist of books, book chapters, papers and abstracts (most published with students. My topics range from Cambrian soft-bodied cnidarian fossils, tectonic displaced terranes in the American Cordillera and study of the paleogeographic distribution and evolution of corals and reefs. Most recently, I am doing research on early Mesozoic coral reefs to resolve the dynamics of the mass extinction at the end of the Triassic period with emphasis on the earliest Jurassic recovery among corals and reefs. A former doctoral student of mine, Montana Hodges, is collaborating with me on this topic, collecting fossils and dating the rocks with detrital zircon. Hodges and Stanley’s research reveals that coral and coral reefs were hard-hit by massive global climate change about 200 million years ago, causing them to collapse suddenly. It took them 10s of millions of to recover and the study relates directly to global climate changes underway today which are undermining marine ecosystems, especially corals and reefs. Foreign Languages: German (Goethe Institute Level-4 Certificate), Spanish, reading knowledge of French; editorial experience. I have taught paleontology courses at graduate and undergraduate levels for much of my career. I have been a teaching faculty in the Davidson Honors College at the University of Montana where I taught several "Honors Courses". I also was a lecturer at the University of California, Davis and taught part-time courses in historical geology at the university/college level in the Washington, D.C. area. Fulbright Research Fellow to Germany; Appointment as Courtesy Professor, Yunnan University, Kunming, China; A Fellow of the Japanese Society for the Promotion of Science; Fellow of the Organization for Tropical Studies (Costa Rica); Foundational Fellow, The University of Auckland, New Zealand.